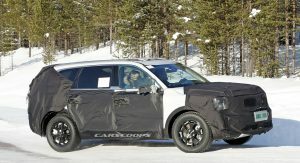 During last month’s Detroit Auto Show, Kia design boss Peter Schreyer came out and blatantly confirmed that his company was working on a production version of the Telluride Concept. 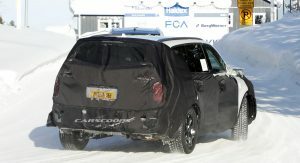 While the production name is still unconfirmed, the fact that we now have a running prototype with what seems like a production body hiding underneath the camo, indicates that the Kia has made a lot of progress with this car’s development, which in turn means that the Sorento will get a big brother in the not too distant future. 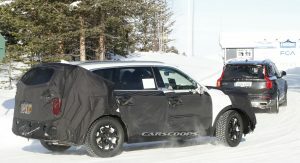 How soon, we’re not exactly sure, but since this is the first-ever prototype caught on camera and to reiterate, it’s not a test mule, the production car should arrive either sometime later this year, or in 2019. 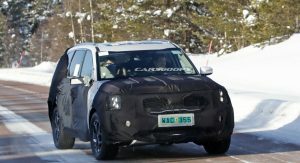 Not only will the production version of the Telluride Concept be offered in North America, but according to Kia Europe’s chief designer, Gregory Guillaume, it could enter multiple other markets, among them Russia. 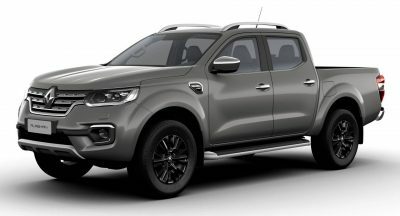 For the rest of Europe however, it “doesn’t make much sense”, added the Kia exec. 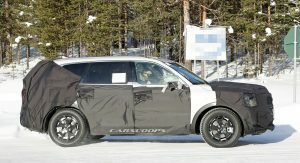 So then what does the Telluride Concept tell us about this upcoming full-size SUV? 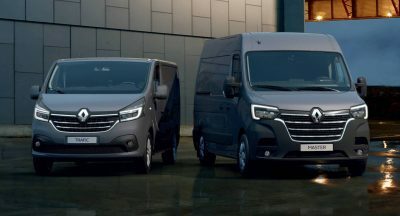 For starters, it points to a boxy exterior design, which is pretty easy to spot, even through the relatively thick camouflage. 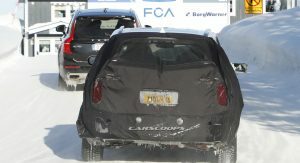 The concept also had these inverted L-shaped taillights, and that seems to be the case on this prototype as well. 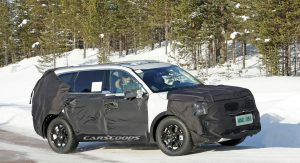 The cabin of the Telluride had a simple yet modern design, so we look forward to seeing whether or not the production car will follow in those footsteps. 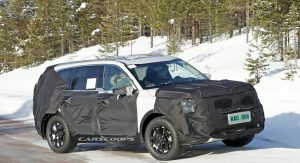 Also, it’s a safe bet to say that modern day active safety and connectivity features will be available, especially since this model will sit atop of Kia’s crossover range. 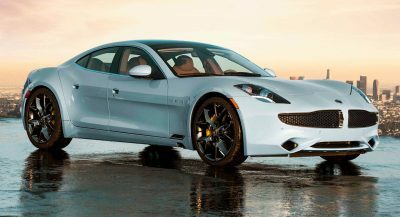 As for its powertrain, the concept utilized a plug-in hybrid system, where a 3.5-liter V6 petrol engine and an electric motor combined for a total of 400 HP. 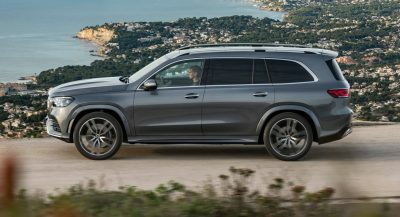 While an electrified version of the SUV is possible, if not probable (in this day and age), we should expect a petrol-only model to be the one welcoming us to the lineup. Yes, they said they will replace the Mohave, been awfully late now. No, this is just the Telluride. 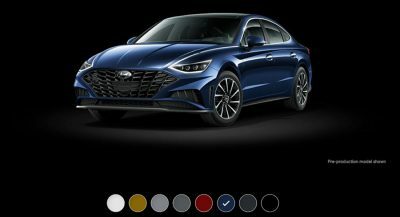 Not exactly a replacement for the Borrego/Mohave as this is FWD-based and won’t offer a V8. love the makeshift side mirror. 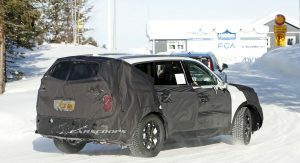 will that be coming into production too, Kia? no dumbass. You’re such a foolish american aren’t you. Boxy style is want I am after! Full size is even is better too! Now, a small underpowered gas engine would make me pass on this vehicle! How about putting something with 380 hp and 400 ft. lbs. of torque with a 10? speed transmission? That would say buy to me! 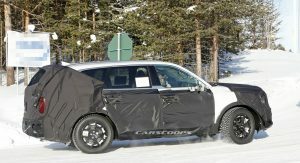 No 10 spd for FWD/AWD application (but coming for RWD/AWD) – H/K are still adding their 8 spd AT to models like the new Santa Fe and the facelifted Sorento. Judging from the proportions doesn’t look like it will be unfortunately. 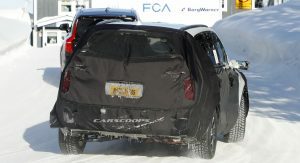 It’s FWD-based and shares platforms with the new, larger 3-row Hyundai CUV. 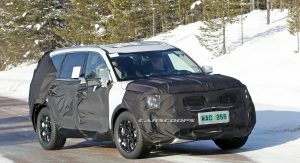 If Kia is to do another RWD CUV, it’ll be off the Stinger platform. 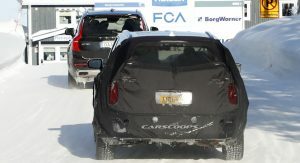 No 400hp hybrid… I hope they at least put the 3.3TT in it because if it’s just the N/A3.3, this thing will be slow. There was some speculation that it might be built on the Genesis platform, but this has obvious FWD proportions. Unfortunately.